Retreat of the Western Interior seaway from the continent at the end of the Cretaceous is the explanation for extinctions on land favored by Archibald (1996), and as noted by Powell (1998), it is the most-cited cause of dinosaur extinction. Archibald's idea was that withdrawal of the sea (regression) would somehow break up habitats on land and that "habitat fragmentation" would hinder the flow of populations of animals and plants between isolated parts of their former habitat, leading to their extinction. We critique Archibald's idea below, but first, some general comments about the relationship (or lack thereof) between regression and extinction. Haq et al. (1988) published a now-famous curve depicting major sea-level fluctuations (transgression and regression) during the past 542 million years of Phanerozoic time. The simple fact is that none of the major episodes of extinction during that time - including that at the K-T boundary - correlate with major episodes of regression. The sea-level curve of Haq et al. also indicates that there were many substantial fluctuations in sea level during the Cretaceous, none of which are associated with extinctions in either the marine or terrestrial realms. In more recent geological time, the major changes in sea level during the Pleistocene were not accompanied by major extinctions of land plants or animals. Furthermore, much like the process of climate change, regressions take place over thousands of years; they are not abrupt, as are the extinctions of animals and plants at the K-T boundary. In any particular area, one would expect the responses of organisms to major changes in sea level to be time-transgressive, yet the record of plants in North America documented in Chapters 6 and 7 is one of continent-wide, geologically instantaneous devastation. This fact alone should render the regression-extinction scenario as unsubstantiated and hard to defend. With particular reference to North America, in Archibald's study area we find that his hypothesis does not stand up against the detailed record of changes in sea level during the Maastrichtian and the Paleocene. The major regression during the latest Cretaceous in this region was essentially complete 3-4 million years before the K-T boundary event (Johnson et al. 2002), but during the rest of Maastrichtian time, rich Cretaceous floras and faunas (including dinosaurs) dominated the landscape. Furthermore, at the very time that "habitat fragmentation" due to marine regression was allegedly taking place, the Western Interior seaway was readvancing into the North Dakota area in minor transgressive pulses represented by the Breien Member and the Cantapeta Tongue of the Hell Creek Formation (Hoganson and Murphy 2002). 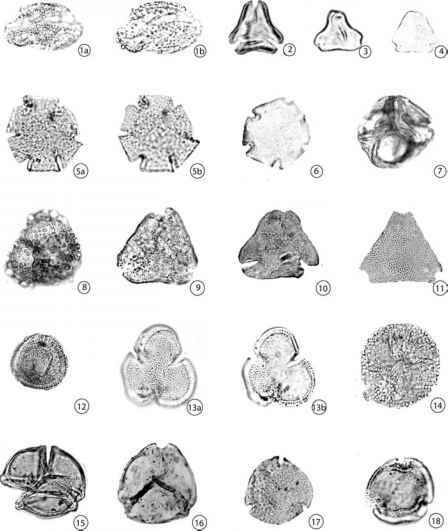 That last transgression of marine waters into the interior of the North American continent culminated with the Cannonball sea, which is represented by the Cannonball Member of the Fort Union Formation (see Figure 6.2). Thus, the habitat-fragmentation hypothesis of Archibald (1996) has no evidential support in the Cretaceous of western North America, source of the world's richest dinosaur faunas and most intensely studied megafloras and palynofloras.